Salmon is such a pretty fish to look at before you eat it. The color is just outstanding and almost unreal, that rather someone painted a square on my plate with acrylics or watercolors, not that a piece of fish is lying before me. That’s the wondrous science of food. It comes in all shapes and sizes and the most vibrant colors that even our minds couldn’t fathom. I think that’s one reason why food fascinates me. Not only does it come in so many shapes and forms, various cooking methods can transform it yet again. We are not cooks or chefs, we are inventors and scientists. I’ve been wanting to enjoy fresh salmon at home for a while, but Rahul’s not a huge fan of it and with it being so expensive, I haven’t made the commitment – until now. Did I figure why not? I won’t quit craving it until I have it, so I decided to try my hand at cooking salmon at home. The butcher at Fresh Market persuaded me to try the wild Alaskan salmon versus the conventional salmon in their counter. The “regular” salmon was much lighter in color than the wild Alaskan salmon. It was almost comical to put them up against each other, but funny enough, it was the wild Alaskan salmon that was cheaper than the “normal” salmon. From there, I took the salmon home and decided to bake it in a somewhat traditional way with lemon and dill. I opened the fridge and spotted the Maille Honey Dijon Mustard which I had used previously for my Grilled Cod Filets with Honey Dijon Mustard Glaze recipe. Dill, lemon, and mustard work well together. The sauce is slightly sweet but also tangy and earthy, which paired well with the salmon without covering up its own distinct flavor. I’ve attempted to create a few lighter meals recently, using chicken or fish or focusing on vegetables. The carbs don’t always have to be the center of the meal, right? In reality, we’ve had a lot of heavy meals (or meals accompanied by a pint of beer) in which the next day I still feel a bit of that meal hanging out with me. The nice thing about salmon or fish, in general, is that I can eat a lot of it without feeling like I just ate a pound of beef. 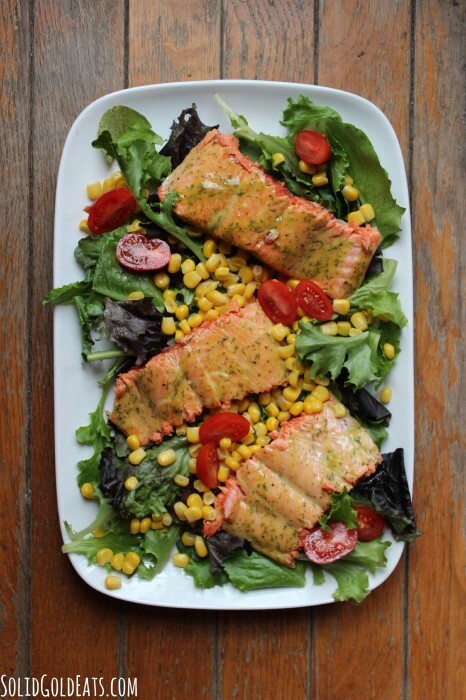 Enjoy this salmon over a bed of lettuce with your favorite salad fixings or simply eat it as is! Above you can see the salmon filets and below you can see how I flaked the salmon to create smaller bites for the salad. Grab a baking dish large enough to lay the salmon down flat. Run your fingers across the fish and remove any bones you may find. Pat dry and set aside at room temperature for 10 minutes before baking. Slice one lemon in 1/4″ or fewer slices. Layer the baking dish with lemon slices. Place the salmon skin side down on the lemon slices. Create the sauce by whisking honey mustard, dried dill, salt and black pepper together. Using the remaining lemon, squeeze the juice into the mustard. Whisk together and spread it on the salmon. I used about 1/4 cups worth of sauce. Bake for 12-15 minutes or until salmon is flaky and comes away from the skin easily. It will lighten up in color slightly and turn more pink than red. Flake the salmon and layer on a bed of greens and vegetables or serve alongside rice. Or just eat it as is. Serve immediately.